Reminder: the deadline for our 2010 calendar contest is Monday, November 16th at noon, EST. The entry form and rules for it — and the other contests that have been announced so far — is here. Keep in mind that the hanging fabric calendar has to fit on a fat quarter of fabric which is, in the case of our quilting cotton, 21 x 18 inches (45.7 cm x 53.3cm), A couple of people have written to ask if their design they upload to Spoonflower is oriented horizontally, will it show up in the voting lying on its side? Answer: We'll all display all the calendars in the voting right-side up. Also, please be sure to take advantage of the tagging field on your fabric details page to tag your calendar design with the word calendar. 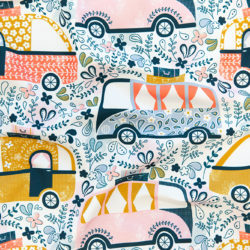 We will preview every design as a fat quarter of fabric. It's fine if there is white space around the design, but any white space will show up in the preview. A piece of fabric that is 21"x18" previewed at 150 dpi will require starting with a digital image that is 3150 pixels by 2700 pixels. If necessary, you can use the 'change size' option on the fabric layout page to reduce the size of the design to fit in the fat quarter. Unless your calendar design fits exactly into the fat quarter area, you'll want to choose the center option for layout. If you have any other last minute questions, please post them in the comment field for this post. As of this writing, we have only nine entries for the calendar contest (not that I'm complaining — nine will be easy to set up for voting!). Fabric of the Week Winner: Bird Calendar Flies Away With It! 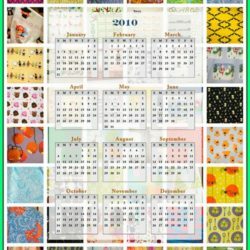 Fabric Of the Week: 2010 Fabric Calendars – Vote now! Wow I just stumbled across your blog and website. Amazing! What a wonderful idea, think I can hear the cogs turning in my brain……. !